When we entered Coron by ship via Super Ferry, we passed by limestone cliffs that just took my breath away. When we went to El Nido, we had to take a 6-7-hour van ride all the way from Puerto Prinsesa. One way. We could have taken the ITI plane from Manila to El Nido but my parents were afraid of plane crashes. We didn’t know that ITI is actually owned by the Ayalas and reportedly very safe. I booked Daytripper for my family to make sure that our long drive would be comfortable, especially for my parents. We had two stops, one for a quick bathroom break and one for lunch at Non La that took about two hours because the service was just really slow. Then we had a three-minute stretching break overlooking El Nido, which was my first glimpse of its beauty. There are 45 islands in El Nido, and not all of them are open to the public. The tour guide during Tour C told us that some of the islands are being preserved until such time when they need to replace the old tour stops. 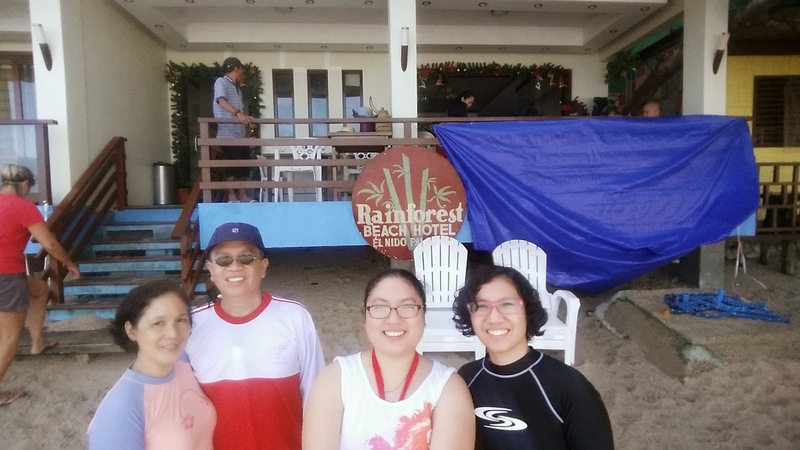 We stayed at the Rainforest Beach Hotel for P3,000/room/night for 4 pax, but it didn’t include breakfast. However, my parents requested that we stay at a hotel that was beachfront, and Rainforest was definitely that. We just had to exit at the back and we can swim right outside the hotel if we wanted to. The room was very basic, and the walls were thin but we were so exhausted each night that we dropped off to sleep right after. The telco signal was very weak/almost non-existent inside the rooms. They have free WIFI it is only strong in the lobby. They provide free drinking water, coffee, and tea, and also sell some soft drinks, alcoholic drinks, and chips. My sister and I had a bottle each of Tanduay Ice our first night as we enjoyed the fresh breeze and sound of the waves slapping against the shore. It felt so perfect and relaxing. One of my favorite parts of my vacation was that there were hardly any sellers at the beach (like in Boracay!). Very few people tried to sell as pearls, although some were persistent. Also, if anyone tries to sell you that necklace where you will open the oyster to get the pearl at around P200+, you’re being fooled. It only costs about P100-P150 in the pasalubong center in Puerto Princesa. 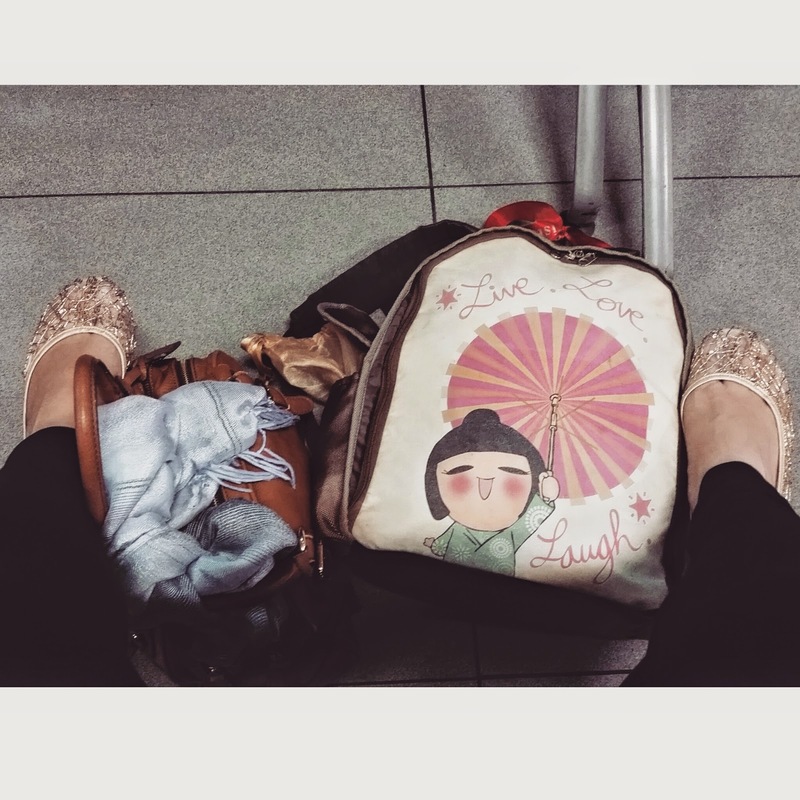 Tip #1: Book your flight and hotel room at least four months in advance, especially if you’re going during the peak season (April-May and December). Most hotels post the peak season rate in their website, which is considerably higher than the low season rate. Check them out months in advance so you’ll have time to save up. Tip #2: El Nido has a lot of tourists year-round, so even if there are a lot of tour companies, book in advance as well. Tip #3: There are several vans that can take you from the Puerto Princesa airport to El Nido. Some vans leave every 30 minutes, while Daytripper only had one trip when we went there. But I wanted to ensure we were not going to have any problems with our ride so I booked four seats back and forth in Daytripper’s executive coach (which was super roomy and they provided a bottle of water per person). Tip #4: There are no ATMs in El Nido, so make sure you have plenty of cash for your hotel and tour (if you haven’t pre-paid), food, pasalubong, and emergencies. Compared to other tourist places we’ve been to, there were very few places to eat at than we expected. However, we managed to wait and get a table at Trattoria Altrove, and the food was delicious. The pizza was oven baked and best eaten fresh. The crust could get rubbery when cold. We ordered a seafood pasta, which was surprisingly delightful, especially since I’m not the sort who likes seafood pasta. If you’re planning to eat here, keep in mind that there’s about a 20-minute wait to get a table and about 10-15 minutes’ waiting time for your food to be served. We also ate at the bagel place, but the pesto was disappointing and left a bad taste in our mouths. Their chicken sandwich was delicious though. We also had to find a breakfast place and one of the two places we found that was open at 7am was Seaslugs, which was about a minute’s walk from our hotel. It’s also beachfront so you can definitely enjoy the morning breeze and view. This easily became our favorite go-to place because the food was tasty and the price was just right. At first serving, I thought I’d still be hungry but the portion was just right for me. Since we only had two days to tour El Nido, because days 1 and 4 were allotted for traveling to and fro PP, I decided to book tours A and C, based on several online research from other bloggers. Tour A disappointed me very much, that I slightly wished we went to Tour B or D instead. I booked our tours with Northern Hope Tours. Our online correspondence went off without a hitch, but on the actual day of the tour, they felt disorganized. They were late in picking us up, and we waited for an hour for the rest of our tour mates, even though our tour mates were early getting ready because they were also told 8:30am. The tour guide also didn’t give us a lot of information about the islands, even though it was part of his welcoming spiel. The second day tour guide was better and he seemed more sure of what he was doing. The best part of the tour, however, was that their food was delicious and bountiful, and they provided free water. On our very first stop at the Secret Lagoon, several of us in the tour crashed against the rocks and went back to the boat bloody. It made me very wary of the rest of the stops and lessened my enjoyment of the trip, because every time I submerged in the water, my wounds opened up anew. In the small lagoon, I was disappointed to see that a lot of corals were almost dead. The fish were also quite few. But I did get the shock of my life when I was snorkeling and a green water snake swam from the rock right underneath me. I knew it wasn’t going to hurt me but it still scared and surprised me. Tip #5: If you don’t have a rash guard, put on sunscreen every three hours, especially if your boat doesn’t have a roof. Tip #6: If your tour guide does not provide drinking water, make sure you bring some on the boat with you. You will get thirsty from all that swimming, and parched from the heat. Tip #7: I recommend fins or swimming shoes because you might step on corals or sharp rocks (like I did) or get stung by water animals. Tip #8: Tourist shirts for pasalubong are a little expensive, but there’s a little store owned by a Muslim couple in one of the streets after the Church, where they sell t-shirts at around P120-P150, no matter the color. Tip #9: Print and bring your tour vouchers (if any) and e-mail correspondence with the hotel/tour company, confirming that they received your payment, especially if you paid online. If you don’t have a physical over-the-counter bank deposit slip, make a screenshot of your payment when paying online. The trip certainly showed me that I do take risks no matter how scared I get, and how much I get bruised from the first try. It was a good self-exploration experience, too.